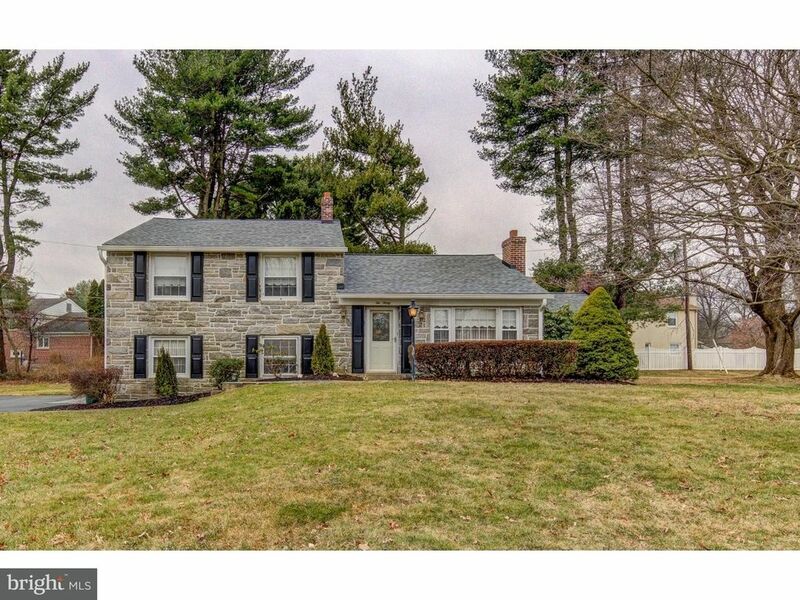 Don't miss this great value in Wallingford-Swarthmore school district! This solidly-built 3 BD, 1.5 BA STONE & brick split level home is larger than most in the popular Sproul Estates neighborhood. It features a bonus main floor Family Room addition PLUS a huge finished Rec Room downstairs, and TWO brick fireplaces. Enter into the Living Room, with large windows, a gracious fireplace, coat closet, and open flow to the Dining Room. The eat-in Kitchen has a gas range and a large cased opening on one wall which provides open views to all the main floor rooms. The main floor Family Room has windows on 3 elevations, a brick fireplace with stone hearth, a separate gas heater, and a door to the rear yard. Down a short flight of stairs, you'll find the expansive 30+ ft. Rec. Room. Featuring a built-in desk/homework space for 2 at one end and a unique built-in bar at the other, this room offers ample space for entertaining & relaxing. This level also features a Powder Room, a bright, white Laundry Room, Storage Room, plus Furnace/Utility Room. Several large windows brighten this space and there is door which leads to the driveway and slate patio. The 3rd floor features a large Main BD, 2 more Hall BD, and a full Hall BA with linen closet. All the bedrooms have closets, plus there is a bonus closet in the Hallway. A walk-up, floored Attic offers great storage and potential for future expansion. Systems incl. newer roof (2016), Central A/C, gas heat, and most rooms have vinyl replacement windows. The .36 ac. property has a storage shed and ample grassy lawn for recreation. Located in the heart of the neighborhood, and not adjacent to busy roads or highways, this property is convenient to the Blue Rte (476), I-95, Center City, Airport, and only 5 minutes from the Swarthmore Train Station. It also offers easy access to Mickey Vernon Park at Bullens Lane, and the charming shops & restaurants in Media and Swarthmore.